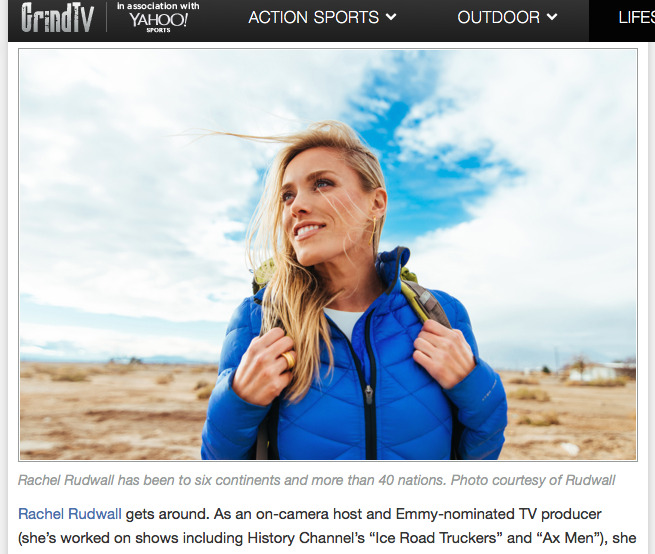 Rachel Featured on GrindTV with "5 Travel Tips You Haven't Heard"
Excerpt: "Rachel Rudwall gets around. As an on-camera host and Emmy-nominated TV producer (she’s worked on shows including History Channel’s “Ice Road Truckers” and “Ax Men”), she regularly drops herself into far-flung locations to relate their stories to outsiders. She’s touched down on six continents and more than 40 nations for TV networks such as National Geographic, Travel, and Discovery. Rudwall is also the co-creator and host of How 2 Travelers, a digital travel series also starring world traveler Andrea Feczko that takes viewers on a weekly trip around the world with videos like “2 Girls, 1 Jetpack,” “Six Strange Things to Do on a Train,” and “Hot Dogs in Iceland.” And if those instant classics sound unlike anything you’ve seen before, Rudwall’s got the travel tips to match: Here are her favorite ways to make your travel experience quicker, easier, and a whole lot more fun (make sure to click the links for full-video explanations of each tip from How 2 Travelers!)." CHECK OUT THE TRAVEL TIPS HERE!